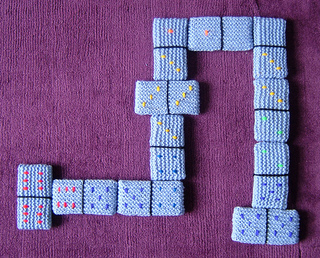 Large-scale tactile dominoes for young children (and older people too). 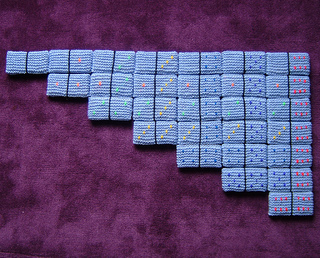 The dominoes shown were knitted with Aran yarn but any yarn could be used. They have a stiff foam filling so they are very lightweight, almost indestructible, and can be washed. Diagrams are included for adding numbers and spots. 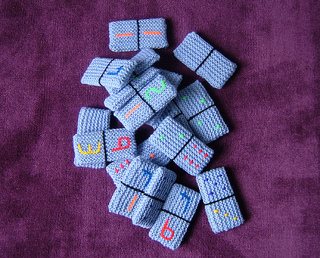 This makes the dominoes a good resource for reinforcing how written numbers relate to counting. If you prefer, you can leave the backs blank, like dominoes you might buy. 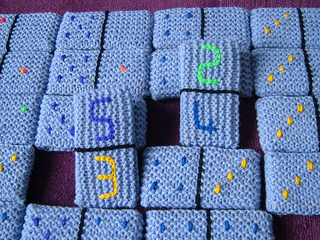 Colours are also used to help with matching the numbers.